If you live in or ever travel to the New York City area, one place worth visiting is Stone Barns Center for Food and Agriculture. This 85-acre farm is just 30 minutes from the heart of the city, which is hard to believe when you tour its spectacular setting and innovative farming practices. In all four seasons, Stone Barns produces much of the food served at the world-class Blue Hill restaurant located on the property. The Center is also focused on training young farmers and home hobbyists in sustainable practices. A key figure behind this remarkable organization is Farm Director Jack Algiere, and the keys to his success lie in good land management – specifically crop rotation and cover cropping. While you may have never heard his name, Jack is highly-regarded by such legends as Eliot Coleman and Amigo Bob Cantisano. 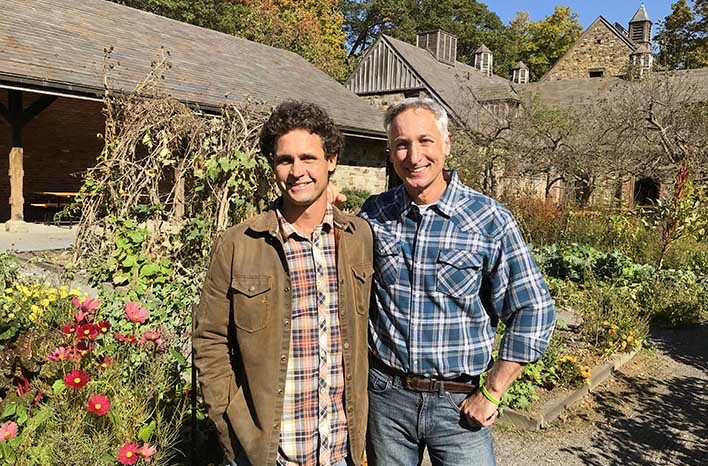 I met Jack while filming for an episode for season nine of my show, Growing a Greener World®. I was impressed by his wealth of knowledge then and have been looking forward to introducing him to you through my podcast. With a degree in horticulture and years of experience overseeing extensive farm operations – including composting in a four-season agroecological system and a world-class greenhouse growing operation – Jack is a prominent go-to guy in the world of sustainable land management and farming. I met Jack Algiere while filming for an episode of Growing a Greener World. I love his science-based approach to land management, soil health, and his passion for sustainable agriculture. While most gardeners are familiar with the concepts of cover crops and crop rotation, few of us have a solid understanding of the fundamental principles and how to put them into best practice in our own home gardens. The methods used at Stone Barns are complex and multi-layered, but you can put the same basics to work in your garden – no matter how small your space might be. First and foremost, let’s take a fresh look at what it means to use cover crops or to rotate crops and why these techniques can elevate your garden to another level of success. Soil is a living organism. Although you can’t tell from the surface, there is so much going on down there, and when it’s well-managed, soil can be transformed from a garden frustration into a finely-tuned, humming engine that is primed to feed your plants and fend off some of your most challenging garden struggles. In its most basic form, a cover crop protects your soil from harsh conditions. Consider it a living blanket to prevent erosion from wind or during rain events. Cover crops protect the soil from developing a crusty and impermeable surface from the heat of the sun or exposure to frost. If you’ve followed me for very long, you know I often mention the benefits of mulch for protecting the soil. A cover crop provides many of the same benefits during seasons when you aren’t growing your edible crops. Most cover crops don’t produce a crop you can consume, and that can require a mental shift for many gardeners. After all, we love growing things we can eat. We also tend to grow the same things season after season. Whether due to space restrictions, climate requirements or our own personal preferences, we stick to a list of favorites. Yet each of those favorites interact with the soil differently – and each is susceptible to particular pests and diseases. Through crop rotation – mixing up the placement of your favorites each year – you can create better soil balance and reduce disease and pest issues. Are several garden beds necessary to “rotate” the placement of your favorite tomatoes or root vegetables? Not necessarily, the principle of crop rotation can be applied in a single garden bed – more on that coming up. 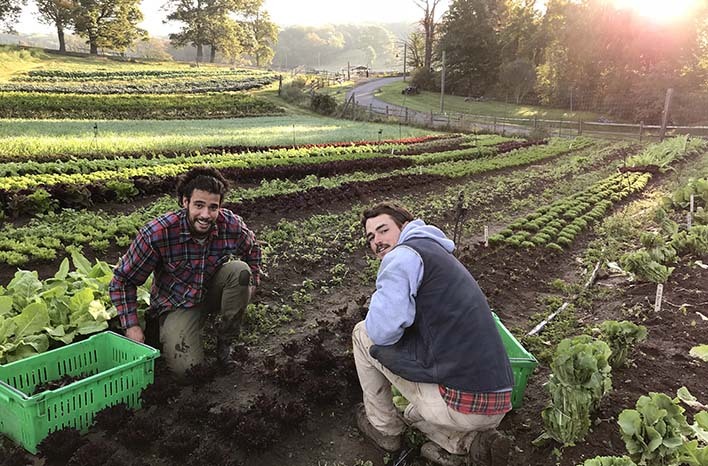 When Jack began his work at Stone Barns Center, he and his team knew that they wanted to manage the land in such a way that it would be self-renewing. They wanted to eliminate synthetic inputs (in other words, fertilizers), reduce the use of fossil fuels, and create a system that would produce food efficiently while requiring as little manpower as possible. Managing 85 acres is a big undertaking for a team of any size, so efficiency was as important to Jack and his staff as it is for a busy weekend warrior. 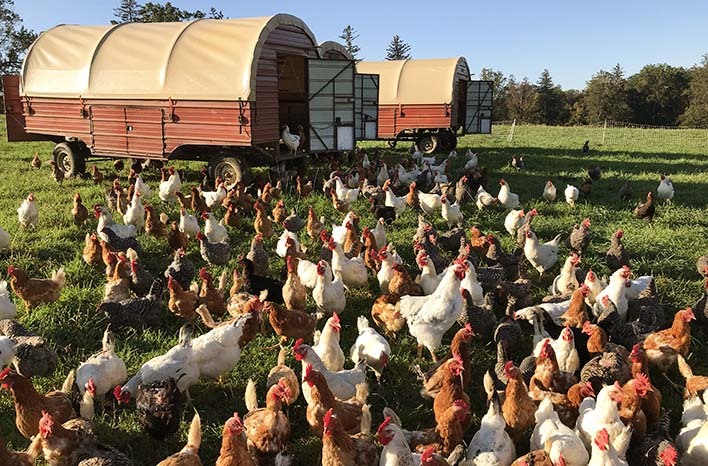 With nine acres of vegetables and nearly 75 acres of open grass pasture to sustain poultry and livestock, a focus on soil health was top priority. Jack developed soil management systems designed to regenerate nutrient balance and promote a healthy tilthe. He and his team focused on reusing resources and keeping byproducts of production in the cycle as long as possible. They weren’t certain of the outcome when they began, but at Stone Barns Center, they’ve learned that less is more and, in the long run, found their approach is healthier overall. Like many of my guests, Jack equates soil health to our own physical health. To be functioning at our best, humans require good nutrition, proper rest and exercise. When we focus on these things, we are able to do more with less effort. The same is true of soil. Think beyond the elements which are in your garden space. Learn how those elements are being used and by whom. There’s more than just earthworms and ants under the soil surface. There are also billions of microorganisms, known as the soil food web. Those microorganisms all have their own complex roles to play in how they interact with your plants. As you add organic materials, like compost, you are adding additional microorganisms – and you are encouraging the procreation of more of the microorganisms within the soil itself. This creates a dynamic and ever-changing environment – that living organism of the soil – which can thrive and mature (or starve) over time. Jack and his team have a complex program established for rotating the many vegetable crops grown over nine acres of farmland. Beyond the organic matter you add, the plants you place within the soil also work for the benefit of the soil food web. As plants convert sunlight through photosynthesis into sugars for growth, some of those sugars are released through the roots into the soil to feed many of the microorganisms living there. Chemicals released by plant roots can trigger microorganisms to go to work or to go dormant. Sounds complicated, right? It is complicated – and fascinating – but it doesn’t need to be intimidating. Jack helps us break down some of the basics, so you can better understand how your plant choices and placement can feed your soil beyond the addition of organic amendments. Each family of plants uses and feeds the soil in different ways. The nightshade family, for example, includes many “heavy feeders.” They require and take up a lot of nitrogen and phosphorus to produce their fruits – like tomatoes. Root crops – like parsnips – on the other hand, take up a lot of calcium and potassium. Why does that information matter? Well when you plant tomatoes in the same location year after year, the soil in that area is constantly depleted by heavy draws of nitrogen and phosphorus. If you swap the location of your tomatoes and parsnips, you are balancing the level of nutrients being drawn up and providing that soil a recuperation from a heavy draw of the same nutrients year after year. Factor in other plant activities such as nitrogen-fixing and you can begin to utilize those functions to add nutrients back into the soil for future crops – in a sustainable way that doesn’t require synthetic fertilizer. The legume family are nitrogen-fixers. They produce nitrogen and return it to the soil through their roots. By swapping the location of your tomatoes with parsnips one season and a legume a third season, you are providing a nutrient draw balance and adding nutrients into your soil to be prepared for the next tomato crop. 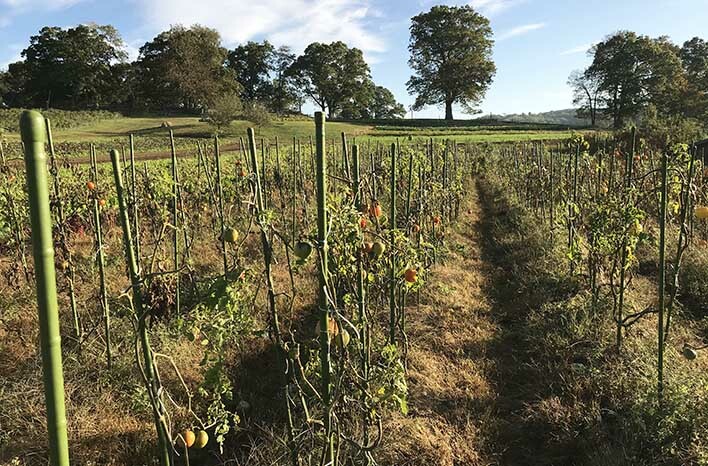 When growing tomatoes on a scale the size of Stone Barns, crop rotation is particularly important for soil health, disease suppression and so much more. 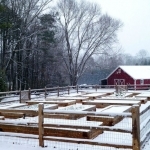 This area won’t be planted with tomatoes for several years. Yet even the smallest home gardens can benefit from alternating crop placement. 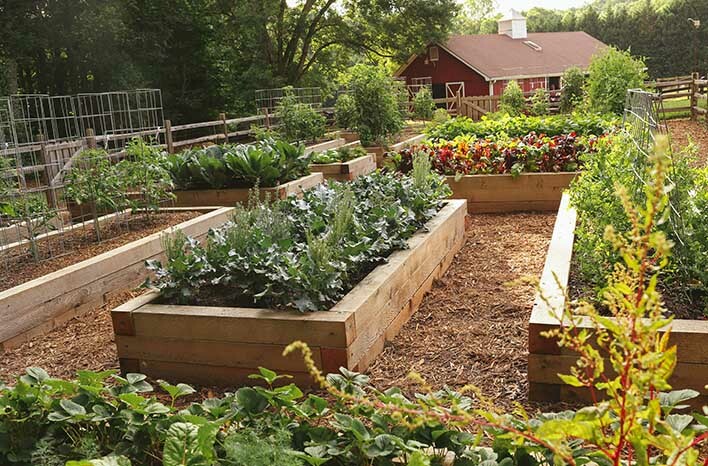 This rotation of crops can be done from area to area – between three raised beds, for instance – but it can also be accomplished even if you have just one garden bed. Rotating placement of edibles within even a small space can still pay off in terms of nutrient balance and return. 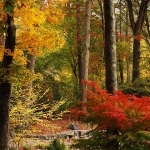 Allow as many seasons as is feasible to pass before you return a plant family to a previous location. 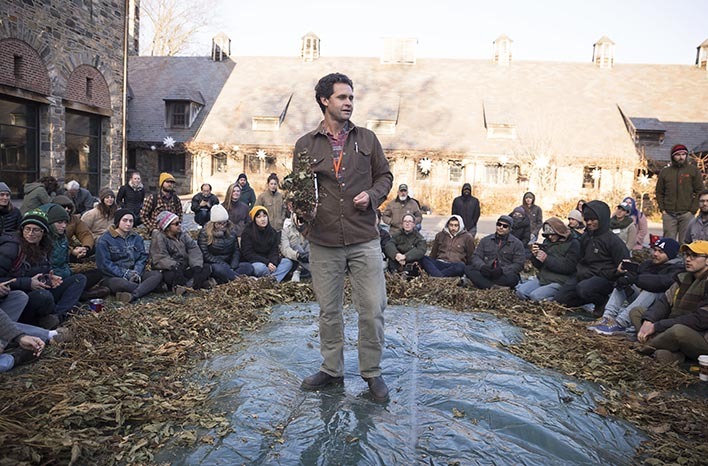 Jack and his team use a 7-year rotation period for some areas of Stone Barns and a 10-year rotation for others, depending on the goals they have for each area. That means some plants won’t return to a previous location for a decade! Few of us have the space or the wherewithal for a system that complex – but that’s okay. As Jack says, this isn’t a prescription – it’s choosing the path that works best for our situation. Don’t feel you have enough room to move plant families around even a little? Maybe you only enjoy growing varieties from one plant family? Try creating extra space or giving your garden soil a rest period by growing in containers for a season. If that’s not an option for you either, don’t sweat it. Crop rotation is not a requirement – just another tool in your garden arsenal. You can opt to use it or opt not to. There is no cut and dry, only-one-way-to-do-this answer. Experiment and observe. The sooner you can embrace that approach to all your gardening efforts, the happier and more successful you will become. Chickens roam free-range across large fenced areas of the Stone Barns Center property; providing nutrition, pest management, soil disturbance, and food for Blue Hill restaurant. If you plant spring crops, summer crops and fall crops; you may already be following a principle of crop rotation. When you think about it, succession planting and crop rotation can be the same thing. While a tomato will remain in place for months, many crops – like beets, lettuce or carrots – will only remain in your garden space for a short time. If you plant another vegetable after each of these short crops are spent, you are planting in succession and (if you plant a different vegetable family in that space) you are rotating. Jack recommends that you take a picture of your garden during different seasons of the year and, then, try to create a different picture the following seasons. Once your lettuce is done, turn in the roots of the spent lettuce and plant carrots in that space. Have you pulled all your beet crops? 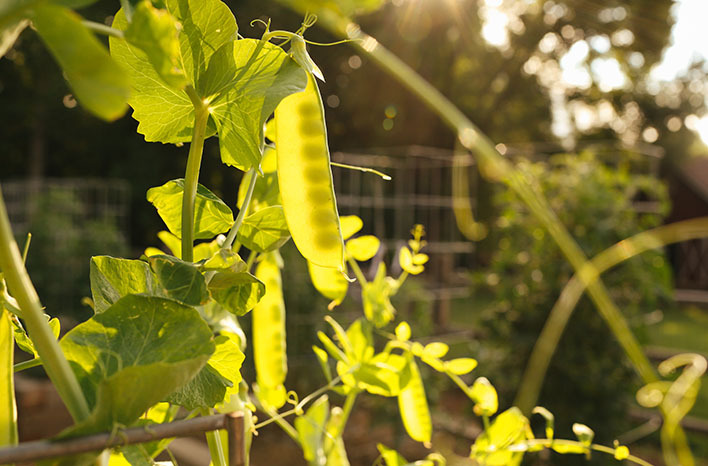 Sow some peas or beans in that vacant garden soil. As your legume crop fades, its space will be available to plant a fall crop from the brassica family – like kale or broccoli. The point here is that, if you enjoy planting crops in succession, you can grow more food while also taking care of your soil simply by being mindful of alternating varieties from within the different vegetable families. There are so many options to take advantage of – it’s one of the reasons the garden excites us season after season. By planting peas as a succession crop to follow my spring beet crop at the GardenFarm, I’m producing more food in less space – while also caring for the soil within that space. Crop rotation while succession planting – it’s a beautiful thing! Pest insects and disease pathogens all tend to prefer a particular variety of edible – or a small group of edibles. Rotating the placement of each variety in your garden space can be a useful method to reduce risk. Changing the location of specific edibles – moving the buffet – can confuse the pests which prefer those varieties. If your plant is struck by disease, the pathogens can remain in the surrounding soil even after the diseased plant is removed. The good news is that some plant diseases can die in soil over time. By planting the edible variety in a different location, you can avoid infecting the new plant with pathogens, specific to that variety, which may still be living in the old location. Some pests, like harmful nematodes, are also soil borne and can present less of a problem to your edible plants, if you switch up the location of the plant variety those soil-dwelling pests tend to prefer. Jack prefers to allow four years to pass before planting a variety in a previously-used spot. It’s not a guarantee your plant will be disease-free, but it’s one more proactive step for prevention. Be sure to take advantage of the disease-resistant varieties available to gardeners today. Selecting a plant with natural resistance is just as important as selecting a plant because it produces a delicious crop, and there are new resistant varieties made available every year. You probably have your favorite varieties – we all do, but challenge yourself to try a new plant or two every season. You just might find a variety that offers all the benefits of your tried-and-true favorite – plus the disease resistance that can lighten your gardening load. 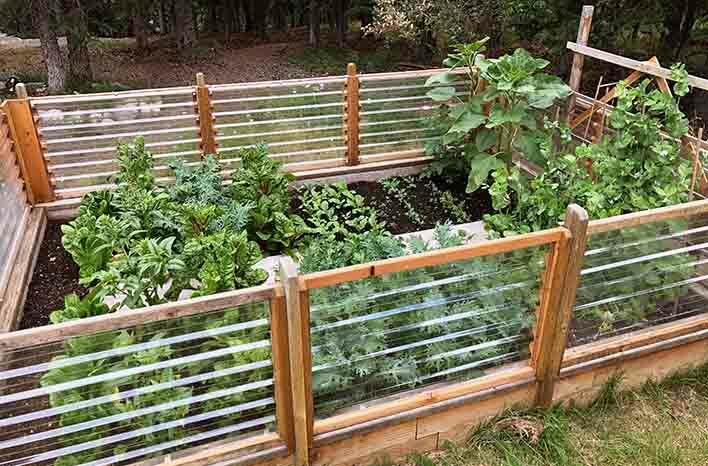 Even a small garden space, like this backyard garden I visited during a trip to Alaska, can benefit by rotating the placement of vegetables within the bed. Have you discovered a favorite disease-resistant variety? I’d love to hear what you’ve grown and what you love about it in the Comments below. Be sure to check back to read what other gardeners have discovered too. I’ve said it many times before, but it’s always worth the reminder: We learn from each other’s experiences and become better gardeners in the process. I guarantee that you’ll learn a lot from Jack’s experiences too. So if you haven’t listened in to this conversation, I encourage you to scroll to the top of this page and click the Play icon in the green bar under the page title. Crop rotation and cover crops are intimately connected in Jack’s approach to gardening and farming, and you’ll hear more on some of his reasonings behind that. I’m diving more deeply into the subject of cover crops coming up, and you won’t want to miss that. So, stay tuned!